Today I’m sharing one of my favorite recipes for low fat brownies. It’s made in one bowl and calls for either prune puree or drained applesauce in place of any oil or butter. However, it’s not entirely fat free because it includes 1 egg yolk and 1/4 cup of dark chocolate chips. 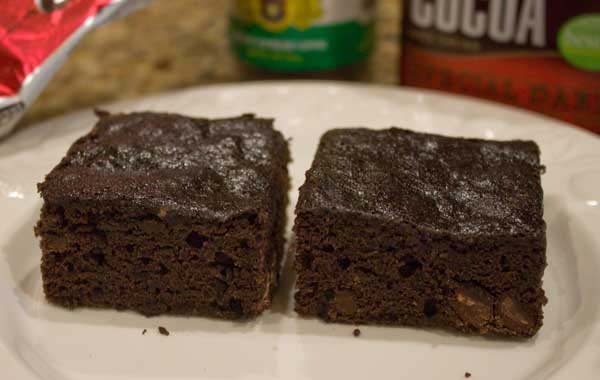 I can’t say these are the best low fat brownies out there because I haven’t tried every recipe, but I love regular brownies and also love these. They’re less rich than my other reduced fat brownies, and while the texture is not as chewy as normal brownies, it’s pleasant and deeply chocolaty. The recipe calls for prune baby food, but I’ve shared this recipe with Katrina who has successfully used “prune-apple” flavor. Drained applesauce works well, and if you happen to have apple butter in the house, you could probably get away with using that, though you’ll definitely get some apple flavor in your brownies. Preheat oven to 350 degrees F. Line an 8 inch square pan metal with foil and spray with cooking spray. Put the egg, egg whites, sugar, prune puree (or applesauce), vanilla , espresso powder and salt in a mixing bowl. With a whisk or a mixing spoon, stir well. Try not to beat any extra air into the mixture, just stir it. When mixed, add the cocoa powder and stir until blended. Stir in the flour. When flour is incorporated, stir in the chocolate chips. Pour into the pan and spread evenly. Hold pan about 1 ½ inches from the counter and drop it on the counter a couple of times to release any air bubbles. You probably won't have air bubbles, but it's kind of fun to do anyway. Bake on center rack for 27 minutes or until set (will still be shiny). Let cool completely, then chill if desired. **To get six tablespoons of drained applesauce, start with about 12 tablespoons or 3/4 cups. Put a stack of paper towels on the counter. Dump the applesauce onto the towels and with the back of a spoon, spread it into a blog abut 1/3 of an inch thick. The moisture from the applesauce will drain into the paper towels. When you’re ready to use the applesauce, measure six tablespoons by scraping it off the paper towels. The point of draining is to remove some of the water trapped in the applesauce. Less water means less steam, less steam means less of a rubbery texture. ***Apple butter may also be used, but the brownies will have apple flavor. Another thing I’ve tested is a mixture of 3 tablespoons of undrained applesauce and 3 tablespoons of apple butter. That works well, too, and the flavor isn’t as apple-y. I think the prune puree works best, though. If you’re watching fat and calories, Mastercook says that a 1/12 serving is 142 calories and 2 grams of fat. The whole batch weighed about 21 ounces, so if you measure portions with a scale, that’s about a 1.75 ounce brownie. Cooking Light has a few good blondie recipes in their database. I’d give one of those a try before I converted this particular recipe to a blondie. It might work, but I’m skeptical. You don’t have much to lose if you try it, though! Nice! I’m looking for a not-too dense low-fat blondie recipe. I’ve been experimenting with a couple of recipes, but I’m wondering what would happen if I used this one, omitted the espresso powder, used flour in place of the cocoa powder and used the applesauce. I’ll let you know how it turns out.